I am spending some time in Penarth, a great small town just outside Cardiff, the capital of Wales. One of its great attractions is the Windsor bookshop. Last Thursday they had a booklaunch. I went along and had the great good fortune to discover the new book Wolfhound Century, and talk to its author, Peter Higgins. I bought the book, read it and enjoyed it. (You can get it from your local bookshop, or Amazon.) It’s such a joy to find well-written, not to say erudite SFF these days, despite the great heritage of the genre, and I really wanted to interview him for this blog. Peter kindly agreed to answer some questions for me, so here we go. When we met at the book launch you said it had taken you 12 years to write this book. Can you tell me about that journey. Were there false starts and thousands of words taken out. Or did it, in the end, unreel smoothly? The idea started off as something quite different from what’s ended up as Wolfhound Century. Originally I was thinking of writing some kind of Robin Hobb/Tad Williams/GRR Martin fantasy, set in the far north. I did a lot of reading about the Northern Crusade, Teutonic Knights, Roman legions in the German forest. I had this image of a small party on horseback riding out into the forest of the Jungian unconscious. But I just couldn’t write it, because technically I didn’t know how. So I put it all away in a box, turned to short stories, and set about learning how to write. When I got to the point where I was getting a few stories published, I decided to have another go at a novel. By that time I’d moved some way from the epic fantasy idea. I still had the forest and the wintry Baltic shore and the wild bestiary, but I also had St Petersburg, marching crowds, propaganda cinema. The totalitarian state and its dissidents. I decided to make it a thriller. The rest of it was all about finding the story. The first version was too slow, too unfocused, and it was my great good fortune that a couple of agents told me so. In a fit of destructive desperation I tried to redo it as a novella. The novella didn’t quite work, but after that I built it back up again piece by piece, in short chapters, putting in only what was absolutely needed. Maximum compression. Yes, I can see that when you say it. It’s very tightly put together, like a well-constructed wooden cabinet with many hidden drawers. You have chosen to set the book in a ‘sort of Russia’. There are Russian names and big steppes and distant prison camps in polar conditions. I see hints of Czech and Croatian too. How did you come to choose that part of our world as your base? What did that give you that other springboards might not have offered. As I’ve said, the topography goes way back. When that got joined up with the idea of Soviet Russia, the whole thing came to life for me. A real eureka moment. There were three things about it that came pretty much all wrapped up together. The first was, I realised that, as a Cold War child, Russia – the Russia of Tolstoy and Dostoevsky, Lenin and Stalin, Akhmatova and Chagall, Brezhnev and Solzhenitsyn – really mattered to me. I’d grown up with it, this resonant, threatening and inaccessible other place. The second was, I needed a city. A shifting, multilayered city, many cities in the same place, colliding, like St Petersburg and Petrograd and Leningrad do. And the third was, that for me the home genre for writing about this world was the thriller: a thriller that would break open into fantasy and science fiction and folklore. That is so interesting, and could set off a whole other conversation about that nature of our lives as Britons in Europe. I will try and stick to the book, though, because there is lots to talk about. I loved the way you used languages for names and nouns, like the forest’s construction, the paluba. I think of this as creating imaginary descendants of existing words and it’s a great way to give the reader the sense of truth without being bound by it. How did you come to use some of the words you have adopted? What a fantastic question. It’s about depth of world-building, I think: the idea that things and words and places have a history, and connections to other things, which you sense, even if you don’t pause to explore them. That whole idea of accretions and connections – typologies, etymologies, genealogies, mythologies, unexpected resemblances, recessive mirroring – is really important. Things remind you of other things. Events echo and repeat. Pattern making. For example, the regime in the Wolfhound Century world makes use of things very much like golems. They’re dark brick-red or purple and they’re called mudjhiks. The root of that word is mujhik, which is Russian for peasant. 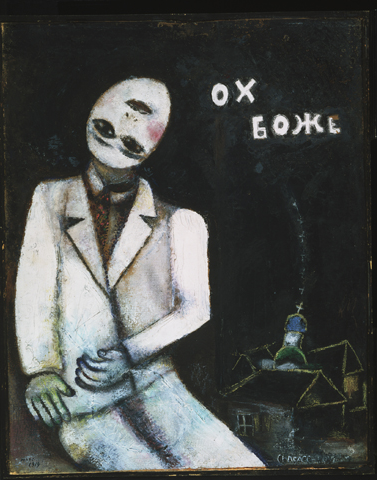 (There’s an astonishing painting by Malevich called ‘The Mujhik’ which shows a gigantic red inhuman, and to my eyes robotic, figure wielding a scythe. It’s a kind of animated, threatening avatar of the hammer and sickle.) The d went into mudjhik partly to make it Russian-ish not Russian, but also because golems (though not mudjhiks) are often made of mud, and because the English word peasant comes from French paysan, a man of the land, and because Adam means ‘red earth’ and Adam was made of earth and mudjhiks are a sort of pseudo-creation, a half-alive abomination. Most of this kind of thing in Wolfhound Century I see as under-the-surface allusiveness. I’m not expecting the reader to pick up on the detail of these namings. In a sense, it’s just my reading of the book. When it matters to the story, which is only very occasionally, I’ll always include a brief gloss on what a word means. Generally, I just hope that, like the allusions and echoes of real historical events and other books and so on, their presence gives the characters and their world a sense of depth and texture. The book takes place in a heavily controlling state, called the Vlast, run by a dictator complete with secret police, torture and arbitrary suppression of dissent. Your main character is a policeman called Lom who is called in, ostensibly because of his outsider status, to hunt down a terrorist. In the process, a lot of people die. In writing the book you’ve obviously thought a lot about the nature of possibility and how different worlds and futures come to be, and the inevitable moral choices we (and our characters) must make. At the point where Wolfhound Century ends, we appear poised between a very bleak continuation of the current arrangements, and a hazy but maybe more human alternative. It feels rather black-and-white. Are there, in your view, any good points, any reason why someone like Lom might feel ambivalent about the destruction of the Vlast, beyond habit. That’s another great question. It sounds like a moral issue, but I think it’s more of an emotional one, and it’s about the psychic texture of the world we live in now, particularly for those of use whose emotional world was built before 1989, whose imaginative roots are in the world shaped by the wars that began in 1914. If you were formed in that world, you know what was lost when the Berlin Wall came down. It’s a good loss – what was lost needed to be lost – but nonetheless it leaves a hole. What comes instead – what you call, and it’s a lovely phrase, ‘a hazy but maybe more human alternative’ – is very different. And now, with what’s happening in the global economy, there’s this growing feeling again of the decline of the West. Der Untergang des Abendlands. It seems to me sometimes that the last and perhaps most poisonous legacy of tyrants is the nostalgia they leave behind when they’re gone, and the empty space for something else to fill. When I talk about things like that, I need to be upfront about the extent to which 20th century continental Europe and Russia share a history which I and my family and the place where I live did not experience. That dark extraordinary history that destroyed tens of millions of lives – the revolutions and wars and genocides and the surveillance states that murdered their citizens – took place elsewhere. We get the backwash, the overspill, the consequences, the ancestral memories of air-raids, the gaps that are torn open, the fear, the four-minute warning, the exiles and refugees, the wild vivid broken art that sometimes escapes destruction. But in our fields the ploughs don’t upturn the human bones. To come back to Wolfhound Century, when Lom starts to separate from the Vlast, his head is – very literally – opened up. New perceptions. New possibilities. Boundaries come down. It’s more personal, but also more mythic, and no less dangerous. One of the themes of the book is that process of unfolding. What it leads to, what can be made of it, whether it is survivable … well, this is only the first part of the story. There are more books about Lom to come. And the Vlast may be wobbling but it’s far from being destroyed. On the book’s website, http://www.wolfhoundcentury.com, you have a great ‘bookshelf’ of work you were reading while writing. I had already thought about The Master and Marguerite, and Babel, Bashevis Singer, Huxley and Zamyatin. It was fascinating to see how many others you acknowledged. What might be your top three that you have found prodded your imagination and your prose, and how did you come to those books? There wasn’t anything special about how I came to them – just picked them up, the way you do. What made them special for me was, they took me absolutely by surprise: they were doing much more than I ever expected, they were fuller and richer and more extreme, they were crossing borders and going into territories I had no idea they’d go into when I took them up. And every time I go back to one of them, it’s changed and there’s something else to find. It is a great pleasure to read really well-written SFF that is wrestling with some of the big ideas of our time. It often feels, as both a writer and reader of such work, that the market has become quite small, so agents and publishers tend not to be interested. Yet not so long ago there was plenty of such work about. What’s your view on the state of the market for such work, and how have you found it finalising and launching this book over the last year or so? The publishing industry, not just SFF but across the board, is obviously going through a turbulent time – the economy, the internet, competition from other media – but it seems to me that SFF writers and readers have a lot to be positive about. For one thing, SFF is writing with a truly international reach. SFF travels well. UK publishers and agents will look at the international, not just UK, potential of what they’re offered, and a writer in the UK can access online and print magazines, publishers and agents in the US, Canada, Australia and so on. It’s a very large, if fragmented, marketplace. Some outlets are very specific in terms of the kind of writing they want – dark sword-and-sorcery, paranormal romance, or whatever – but there are also places for all sorts of ambitious and complex stuff, and there are editors and, more importantly, readers out there who are willing and eager to welcome new voices and new ideas. The other thing about SFF is that there’s a thriving and active readership, and loads of thoughtful and wide-ranging blogging and on-line forums. That was the biggest eye-opener for me, as I went through the process of publishing a book for the first time. I hadn’t understood before how close and responsive the engagement is between people in the publishing industry – editors, agents, publicists, art designers – and their readers. It’s hugely facilitated by the internet, through blogs and Twitter and forums like Goodreads, and publishers are putting a huge amount of effort into building those links and relationships and listening to what’s coming back (as well as marketing to it, of course). As a first-time author, it’s absolutely terrifying to see all this immediate feedback flying back and forth in response to the Advance Reader Copies (which are in circulation for months before publication) and the early online reviews. But from a wider perspective it’s fantastic. The depth and thoughtfulness of the reviewing on book blogs can be really good, and if publishers are paying attention – as in my experience they are – that’s got to be a good thing for all readers and the future of writing. There must be a sequel! When can we start looking out for it? 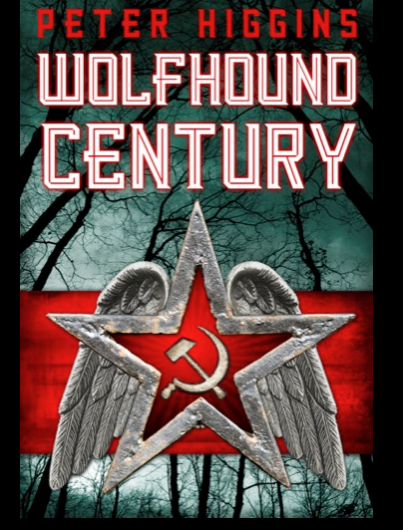 Wolfhound Century is the first part of a trilogy: it’s a single story arc played out over three books. The next part is coming out early in 2014. Thanks so much for answering my questions and keep us posted on events in Vlast, the archipelago and beyond. This entry was posted in Reviews and tagged Cardiff, Penarth, Peter Higgins, Windsor Bookshop, Wolfhound Century. Bookmark the permalink. 1 Response to Wolfhound Century by Peter Higgins – Interview! Hi Sarah! I’ve nominated you for the Very Inspiring Blogger Award! Click on the link below to read my post about it and learn the rules you are asked to follow on being nominated. Nothing is obligatory of course!